I seem lately to have been reviewing a high percentage of fairly stark boats; boats to be worked, boats to not need a lot of attention. My sort of boats, frankly, an attitude earned from an early history of varnished timber boats. The review boat, a 5.5 metre plate boat from Stessco called a Renegade, is probably more frills-free than stark – but no one would detect much luxury here. It is, though, immensely practical and robust. Stessco has for untold years been a builder of pressed aluminium boats, but the Renegade is in plate. Perhaps this is part of a scramble for diversification like so many other Australian manufacturers. Or just means Stessco recognises WA’s fondness for the heavier construction. Layout is cuddy cabin with no fore deck; not a trace of one. The cabin-driving position shelter is moulded in fibreglass and took advantage of the material to make a curved structure that ends in a point at the bow. The cuddy has great volume and no rear bulkhead. It contains nothing beyond its carpeted deck. For most people this is of more practical use than the usual V-berths. As well as offering bulk storage space it makes a retreat for children bored with fishing: here is room to lay out electronic paraphernalia or to unfurl bed rolls. Seating is limited to a pair of swivels at the windscreen. This takes care of the usual fishing complement; others who board can sit on the transom itself or bring cushions. It sounds rugged, but actually addresses the realities of a fishing boat: unnecessary seats handicap its effectiveness. The seats are mounted on locker boxes, and contrary to the boat’s Spartan image are comfortable; a neat match in resilience to the boat’s motion under way. The seats’ positioning allows uncramped standing, which is many people’s preferred mode of travel. For these travellers a grab rail is provided around the edge of the windscreen. The seats swivel allowing their occupants to fish under the shade of the Bimini. This is mounted high enough to suit the tallest of standing people, and the no-nonsense image extends to eliminating clears between it and the windscreen. Clears, which add surprising dollars to a boat’s price, are actually used for a very small percentage of its life. A 115hp Yamaha two-stroke supplied power on the review boat. It is unusual to see two-stokes this big nowadays, but the buyer is used to them, likes them, and is probably happy to pay the considerably lower price. Of course it shares no kinship with the smoking, tricky to start horrors of yesteryear. In behaviour, the only qualities to set it apart from a four-stroke of the same power were a bit better acceleration and the different sound. That said there are people who buy four-strokes principally for their less harsh exhaust note. 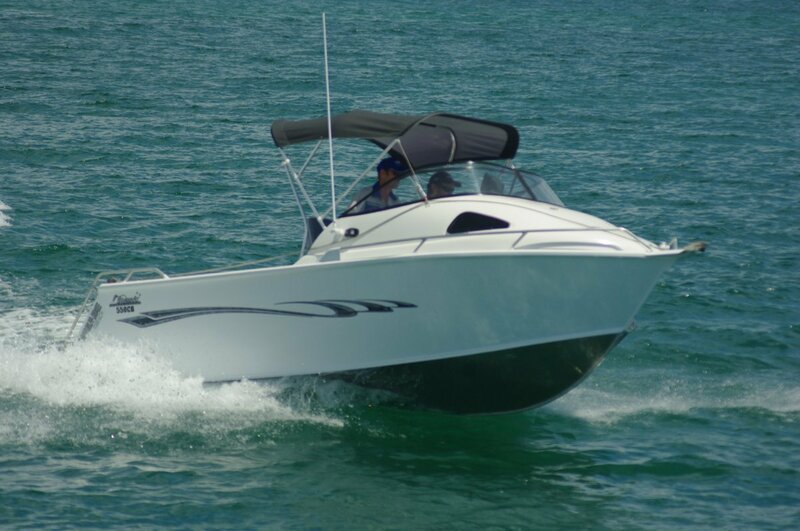 The key features of this boat are the roomy cockpit and the above average stability at rest. They are probably a fisherman’s top two requirements; far more important than say outright speed. The 115 horsepower is more than capable of good speed in the right conditions, but with a hull optimised for fishing it prefers you to save big throttle openings for the right day. Fishermen will also like the live bait tank, and owners of whatever persuasion will approve of the self draining deck. There are plate hulls that retain the typical pressed boat’s carpeted marine ply deck, but the Renegade is not one of them. The deck is carpeted, but is also a sealed aluminium self drainer. Its carpeting extends to the vertical part of the transom lockers, making for a particularly neat interior.